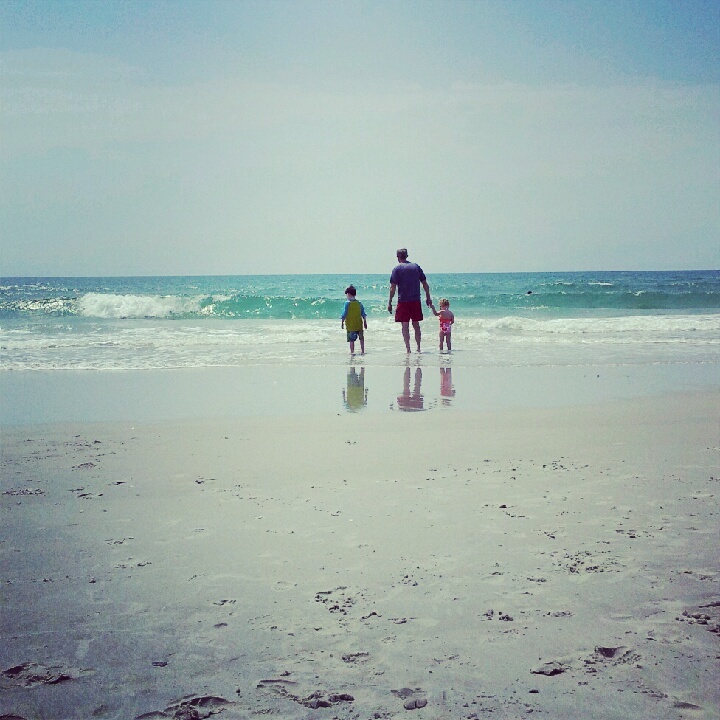 In North Carolina, we are lucky. We have the scenic coast and the beautiful Appalachian Mountains as great choices for family vacations. In Raleigh, we can get to both within hours. My family recently spent a few days in North Carolina’s High Country Mountain area, and our destination was the Boone-Blowing Rock area in Watauga County. 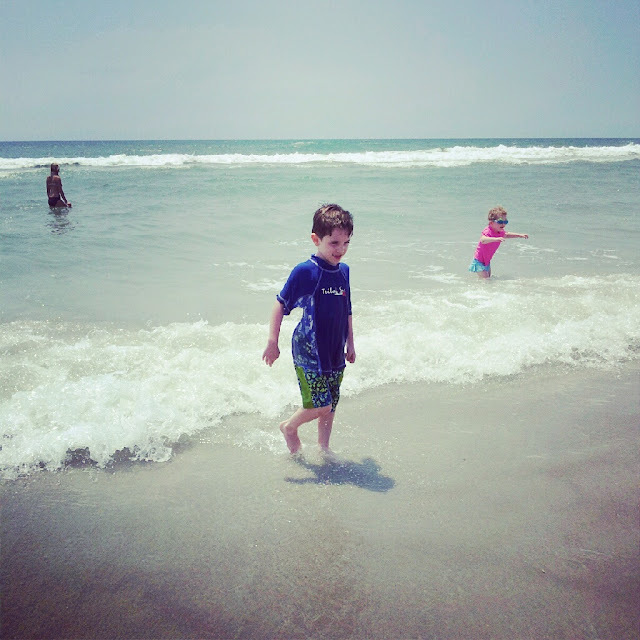 We didn’t see everything, but I thought I would share my views on why it makes a great vacation destination. The Blue Ridge Parkway, the 77-year-old highway that links Virginia’s Shenandoah National Park in the north to the Blue Ridge National Park in the south, snakes through the Appalachian Mountains. 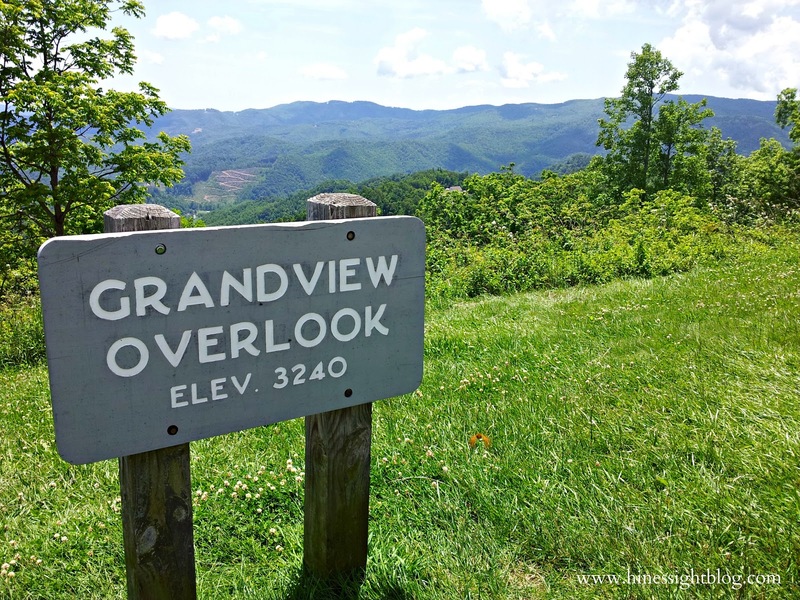 The Boone portion of the Blue Ridge Parkway is a pivotal point along the scenic highway. 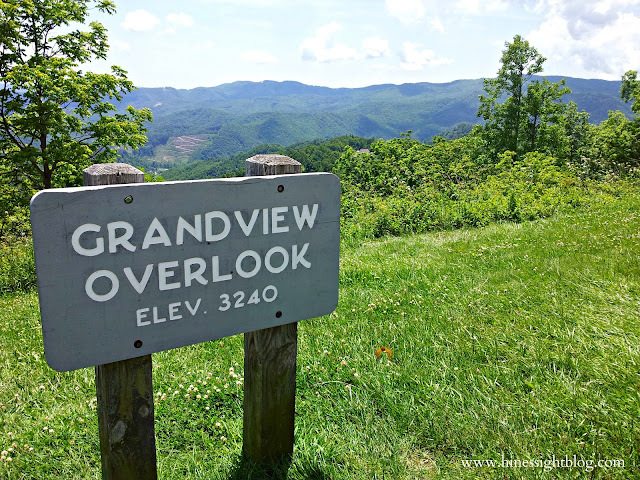 We didn’t make a trip to Grandfather Mountain, the tallest mountain in the Blue Ridge located in Linville, N.C., on this trip, but it is a must-see when in the area. We were short on time, and we wanted Baby Diva to get a little older before making that trek across the famous mile-high swinging bridge. 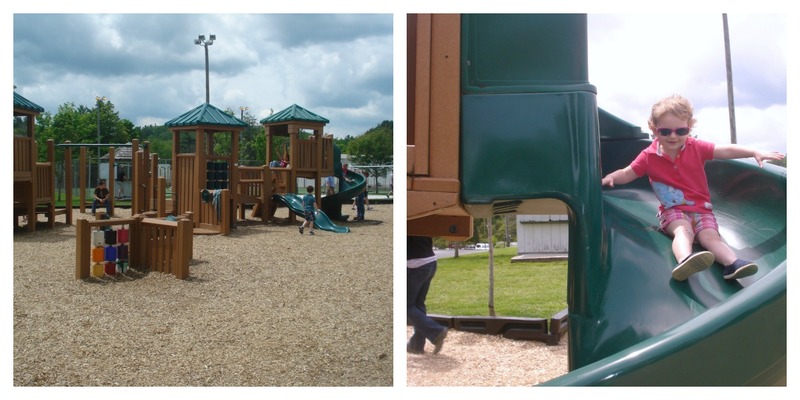 This park is wonderful for families, though, who like to hike and explore. 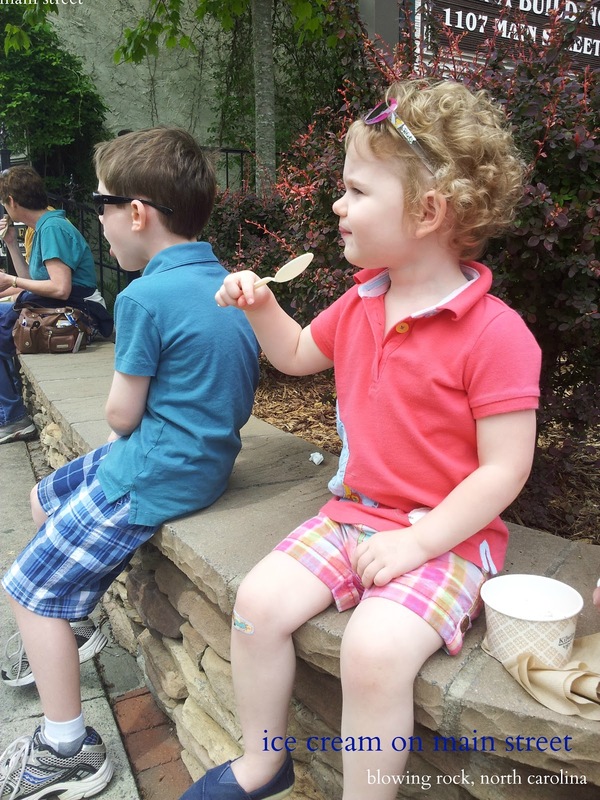 I have talked about the beautiful town of Blowing Rock in a previous post, but I cannot emphasize enough how much fun it was for my children to play in the park, eat ice cream, and stroll down the main street. Even if you are just passing through the area on the Blue Ridge Parkway, get off and take some time to stroll the streets of this charming town. And talk about a kid in a candy store! 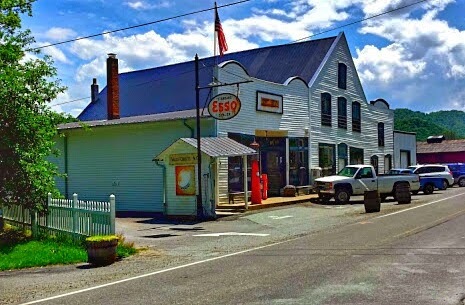 The Mast General Store, established in 1883 in Valle Crucis, North Carolina, is on the National Register of Historic Places. The annex, located down the street, has over 500 types of candy for sale. I am not exaggerating. It’s incredible. 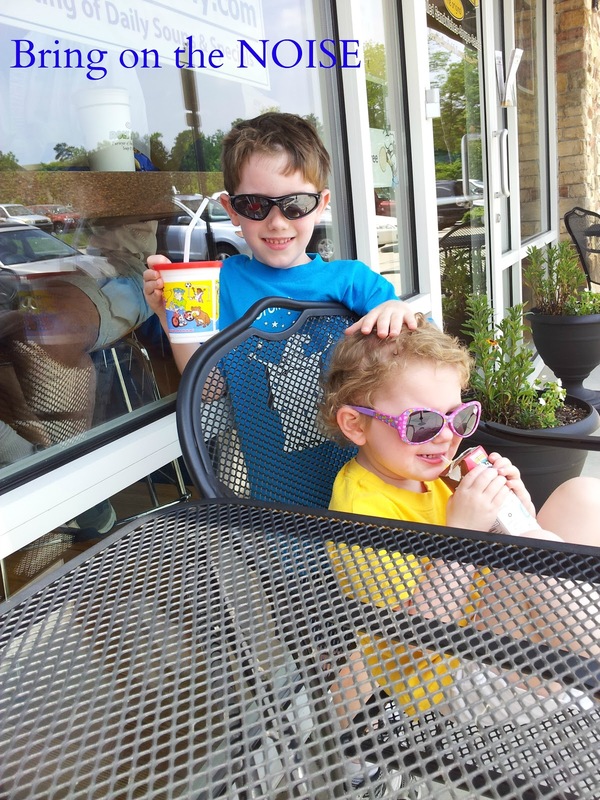 And it’s hard to get your kids out of the candy store, but if you tell them that you are going to the adorable park behind the candy store, then you may get them out of the store a little quicker. 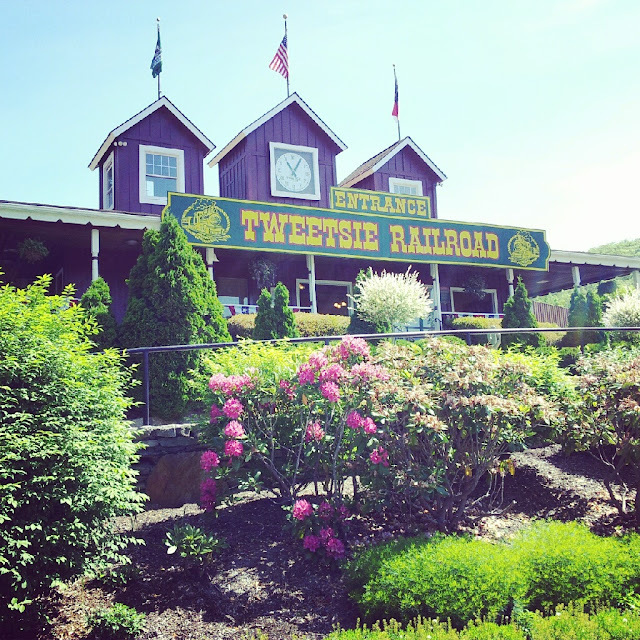 If you ask my children what they enjoyed most about our trip to the High Country in May, both will say “Tweetsie Railroad.” So what if Baby Diva is afraid of any mode of transportation other than a car; she still had a great time at Tweetsie Railroad, located between Boone and Blowing Rock. 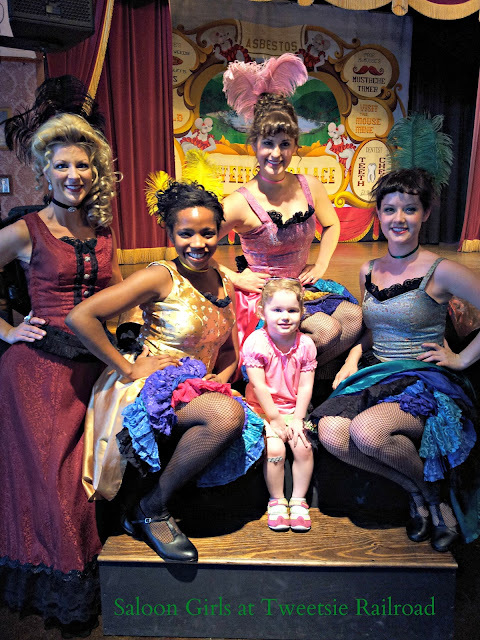 She didn’t get aboard the famous train, and she cried hysterically as she rode a bus to the top of the mountain, but she loved every other minute of this historic, fun amusement park. 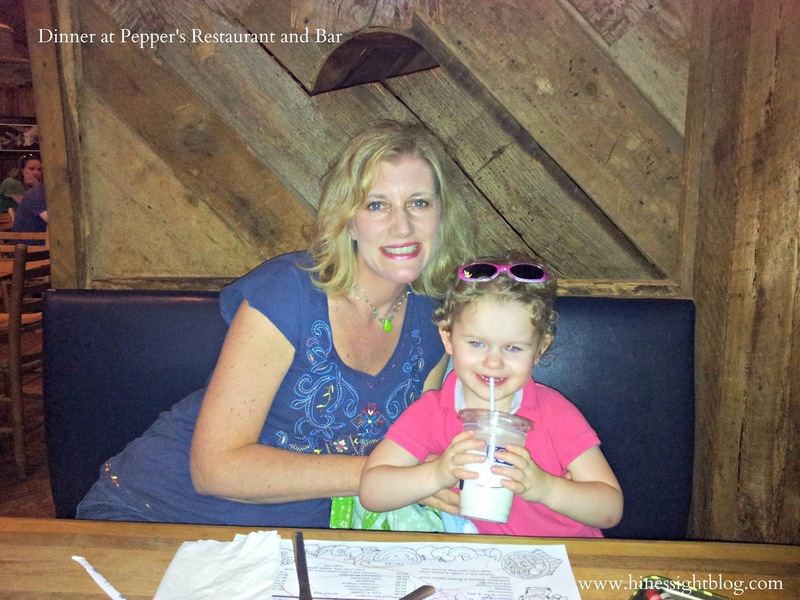 On one of our nights in the area, we dined at Pepper’s Restaurant and Bar, which is a member of the Boone Independent Restaurants Organization. 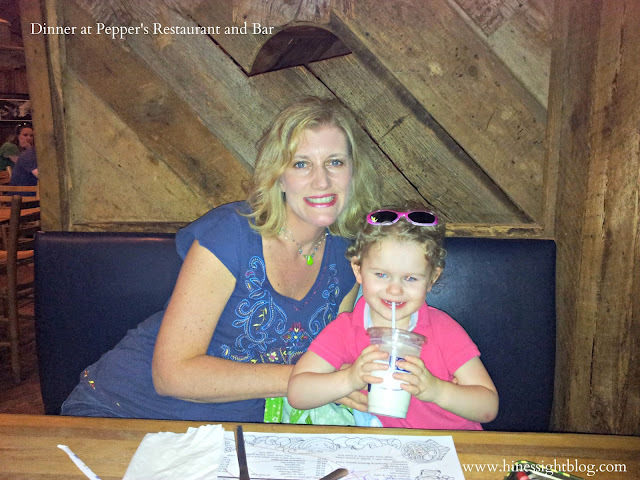 Pepper’s was a great family choice for us, and the bar-type food was delicious. They have a fabulous children’s menu, too. Pepper’s also helps support North Carolina breweries by dedicating ten taps for N.C. beers, and they have numerous N.C. beers by the bottle on the menu as well as other popular national brews. 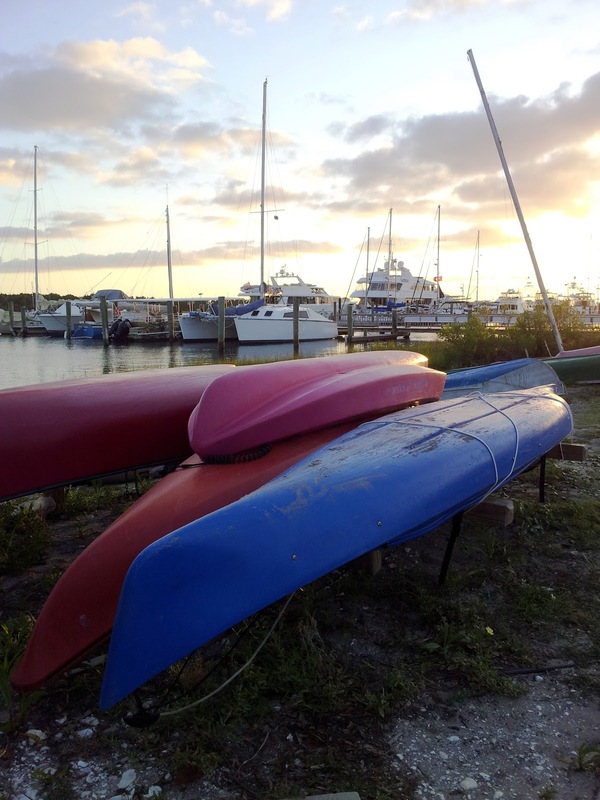 In the winter, the Boone area is a bustling ski community, but in the summer it is the perfect playground for hiking, rafting, tubing, kayaking, biking, ziplining, and all things active. There is also golf, tennis, and swimming plus luxury spas, and local wineries in the area that are open for tours. 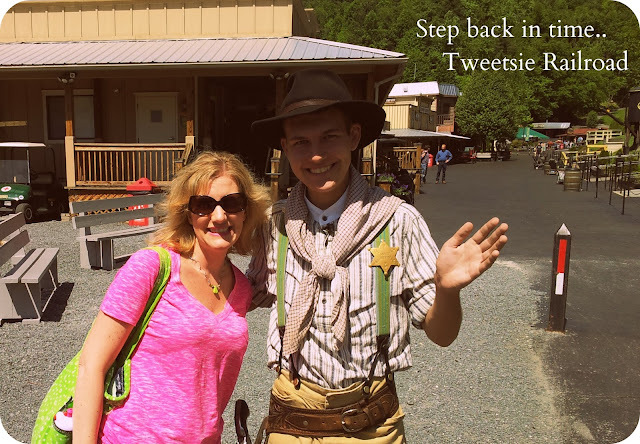 In Watauga County, you can be as busy as you want or do as little as you want. 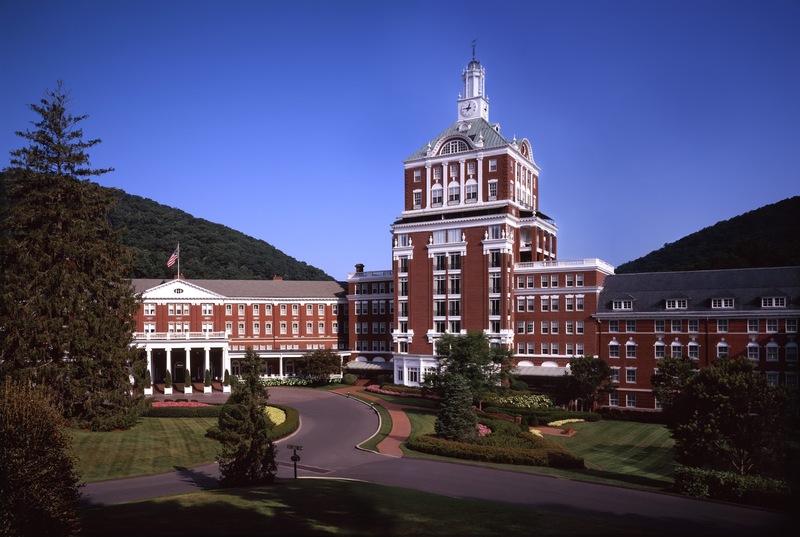 ExploreBoone.com can help you plan your special itinerary. 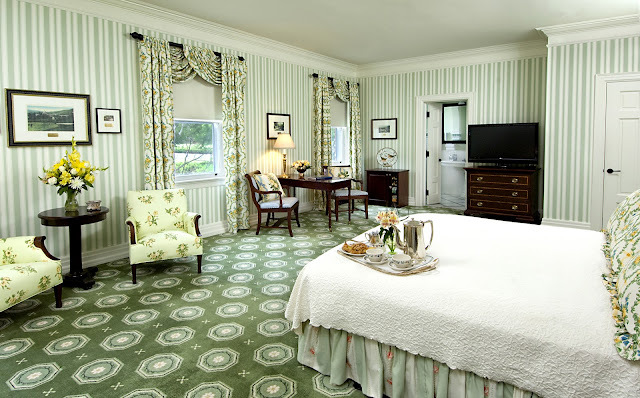 This luxury bed and breakfast inn, which is now a member of Historic Hotels of America, is a luxury haven in the small mountain village of Valle Crucis, North Carolina. We stayed in one of the inn’s family cabins, and you can read about our stay in May’s“Pack Your Bags” segment. Our only regret was that we didn’t stay long enough. I highly recommend renting a family cabin to explore the area. The Mast Farm Inn does not disappoint the luxury traveler or the foodie. 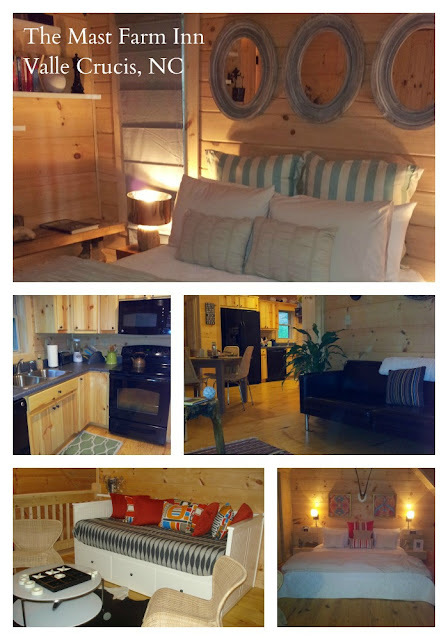 The historic farm house is perfect for couples who want a romantic getaway, or if you want a little more space and a kitchen, the larger cabins provide a peaceful sanctuary away from it all. Now, that’s a vacation! My family also stayed one night in the brand new CourtyardMarriott in Boone before checking into The Mast Farm Inn. 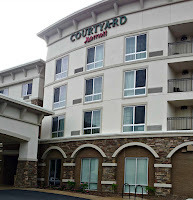 This was my first time staying in a Courtyard Marriott after many years, and the first time with my kids. The hotel chain’s new slogan is, “It’s a New Stay!” I couldn’t agree more, and I think the hotel chain is doing a great job on providing guests with what I call “affordable luxury” for families. This Courtyard looks like a regular chain hotel on the outside, but when you walk in you get the feel of a luxury boutique property. This is why I chose it for our trip. With special touches like a reading area, a fire-pit area, and a bistro that serves wine and beer, it embodies the quality of a four-star hotel. Our bedding was nice, and the beds were as comfortable as I have found in the chain’s upscale sister properties. 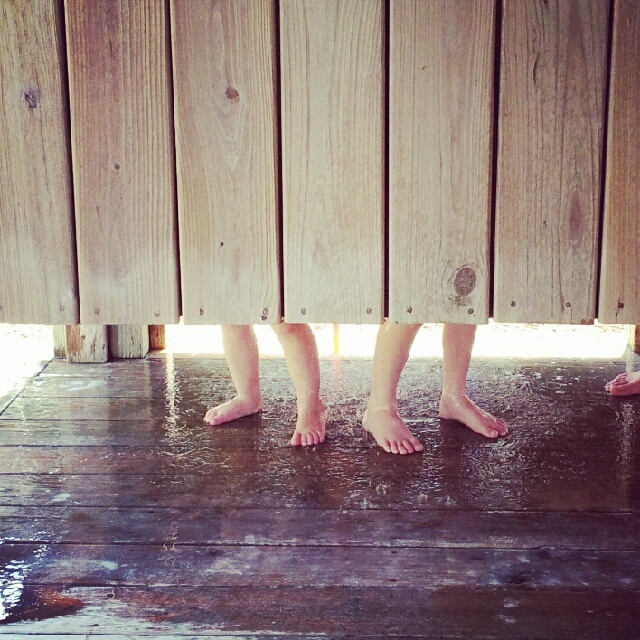 It certainly doesn’t have a resort pool, but the small indoor pool was a fun experience for our children, and it was exciting for them to go swimming one night before bed. I would definitely stay at the Courtyard Marriott again and would perhaps even seek one out if I was passing through town for an overnight stay. I received a media discount on my stay at the Courtyard Marriott and was a media guest of The Mast Farm Inn in order to write my “Pack Your Bags” feature. All opinions are my own and are not influenced by the hotels. I try not to show my age. I really do, but sometimes having young children later in life takes its toll, on the ears. I had great dinner with a girlfriend of mine the other night at Cameron Village. We sometimes say we are twins separated at birth. She, too, was a journalist. 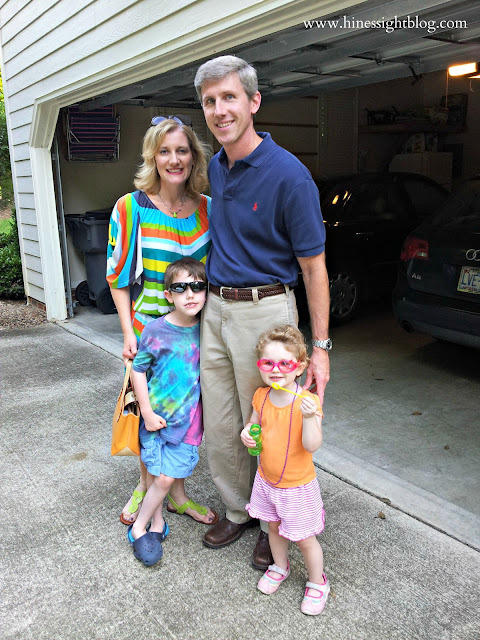 We had our first child in our late 30s, both boys. 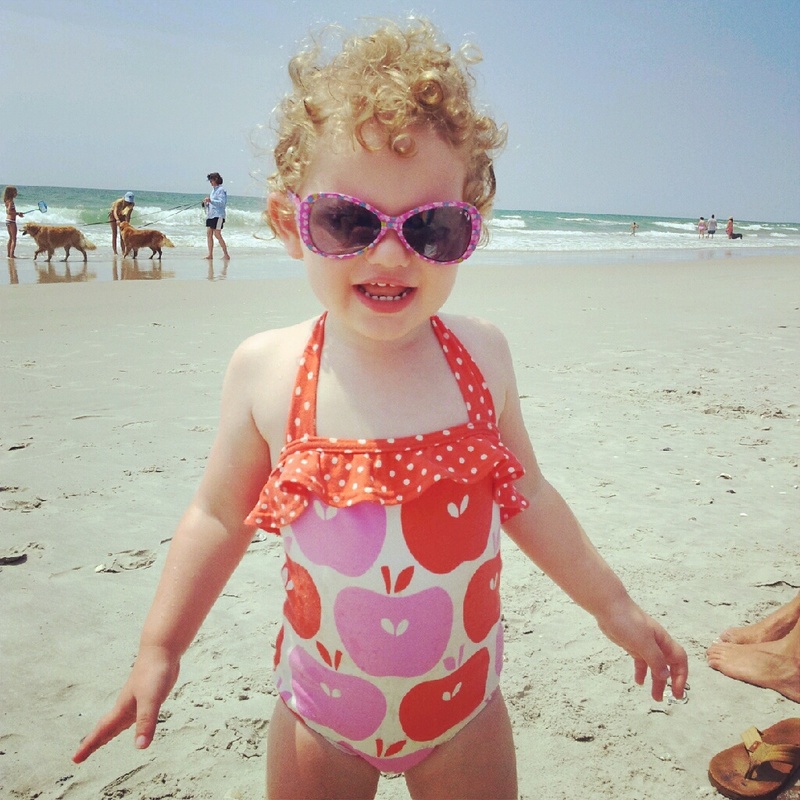 We are “only children” in our families, and we grew up in small North Carolina towns. We were even working in the same office when we were pregnant with our sons, and both of us chose to stay home with our kids, full-time. We have a lot in common. On this night, we were talking parental woes. It’s not surprising that we both had the same complaint. She has only one child. I have two, but my youngest doesn’t really make noise. My first child takes the “making noise honors” in our house. Apparently, my friend’s child is just as noisy. enjoy a nice, quiet dinner. However, my friend thinks it could be the fact that we are only children and are not used to having constant noise around us. She pointed out that we didn’t grow up with a lot of noise. That’s a good point. I didn’t. The only noise I really heard was the TV. I didn’t have a lot of kids in the neighborhood to play with, either. I had a rather boring, quiet childhood. This got me to thinking. Does our “only child” status make us less tolerant of noise? Probably so. But I still think age may play a role, too. Noise bothers me a lot more at 4 p.m. in the day as opposed to 10 a.m. I think by 4 p.m, I am spent. Noise at 8 p.m. is just a downright crime. I. Can’t. Stand. It. By that point, I want to just run in my closet and hide. Either that, or I start to yell at my children like a crazy lunatic. And it’s not just the kid noise they make. It’s TV noise. Music noise. Toy noise. It’s all sorts of noise that children generate. My son loves to use my husband’s laptop while I’m writing. It’s hooked up in our office adjacent to my desktop. I can’t stand the noise he makes while I’m on my computer. Some game dings. He’s humming. It drives me batty. My husband actually brought out earphones for my son to use while in the same room as me the other night. It was an improvement, but he was still making noise with his mouth. 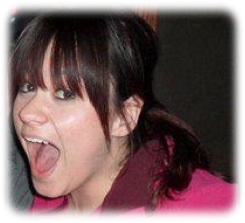 Singing. Humming. Talking. It’s nonstop. I can’t think. He is like the Energizer bunny of noise. But I may have the solution. I’m the one who needs the earplugs or headphones, not him. What do you think? Do you have quiet children? 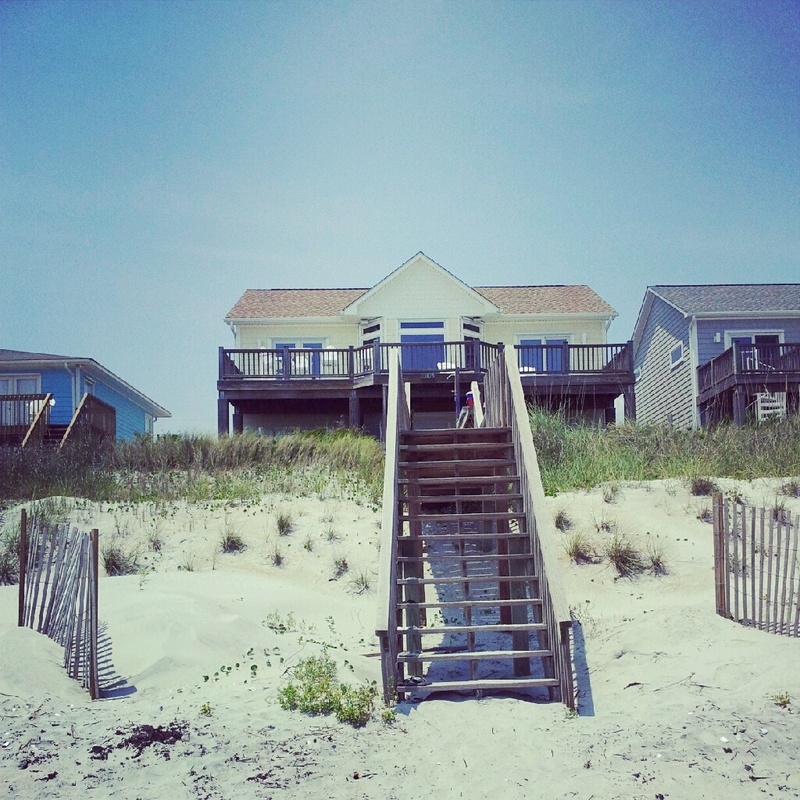 Greetings this week from Topsail Beach, North Carolina. 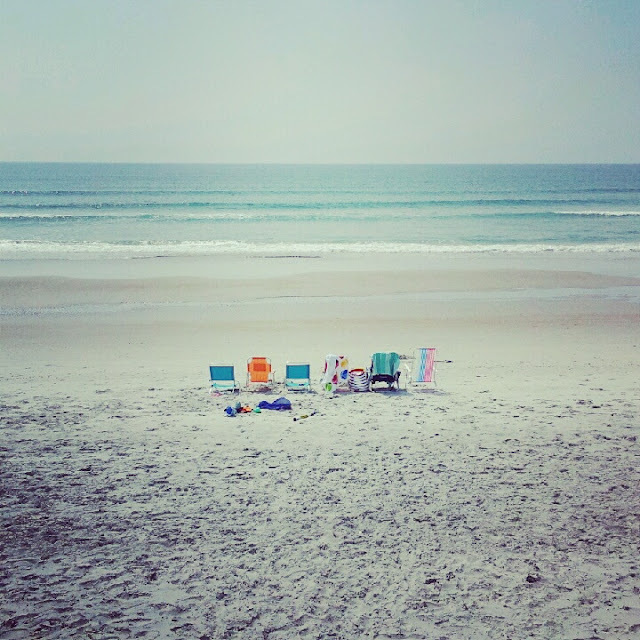 As I said on the blog's Facebook page earlier, I have a chair waiting for you. We are having a wonderful time here with family. I will share more photos at a later time on this site, but I did want to update you on some exciting news for me. I am now a travel contributor for Skimbaco Lifestyle Magazine with Katja Presnal. My first piece on Charlotte, North Carolina ran today. I am very excited about this opportunity to work with Katja, and am so pleased she has given me the opportunity to write about luxury US Travel. I will be sharing these links on Facebook and Twitter. It's time to go back on the beach, but I will be back here next week with some new content. Please welcome a few guest recipes today as my family vacations on the North Carolina coast this week. I'm eating lots of food, reading lots of blogs, and am enjoying having people around to help me with my children. Heather Smith has some great recipes to share with you today. She's an ex-nanny so she makes sure her recipes are kid-friendly. 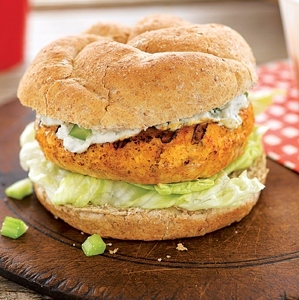 After reading them, I cannot wait to try the Buffalo Blue Cheese Chicken Burgers, but as the headline states, these are three recipes the whole family will love. I'm excited to add them to my meal plans. I hope you will, too. Burgers, pizza and mac & cheese, we have your family dinner covered. Here are 3 different recipes that your family is sure to love and ask for seconds! Enjoy! This recipe has the taste of your favorite pizza but half the calories of a real one. What is great about this recipe it doesn’t take long and you can add ingredients to make it taste like your favorite pizza. Try adding olives, onions and sausage for a different taste! • Line a baking dish with foil and spray with cooking spray, this makes for easy clean up! • Thaw your chicken breasts and place on cutting board with a piece of wax paper or saran wrap. Pound chicken to make it thin and easier to roll. • Now build your chicken breasts. 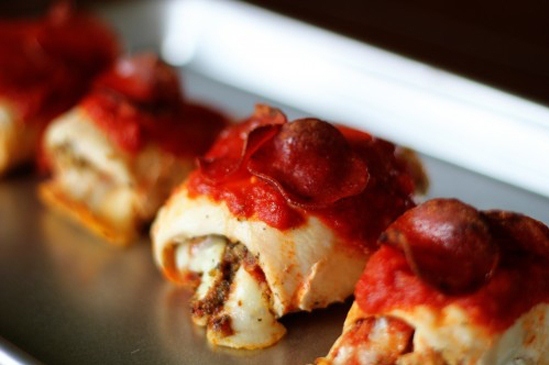 Use a portion of the pizza sauce and cheese and your preference amount of seasonings, 2 pepperonis on each breast, and now roll and place seam down into your baking dish. • Use the remainder of cheese, pizza sauce and pepperonis on top. • Bake for 25-30 minutes at 375. Have a craving for some tasty wings or the kids wanting a new spin on the burger? Try out this tasty meal and watch them ask for seconds. This recipe is also lower in calories than one would think. Pair it with a nice summer salad and you have a great weekend dinner planned! • Fire up the grill and until it is hot and ready. • Combine ground chicken, half of the blue cheese, egg, celery, bread crumbs, half of the BBQ sauce, dash of your favorite hot sauce, salt and pepper into large both and mix thoroughly. • Create 4-6 patties (depending on size you want) and then coat patties with remainder of BBQ sauce. • Grill until grilled and serve with remainder blue cheese crumbles on top and with traditional burger toppings of your choice. Skip that little blue box and go homemade when making your mac and cheese. A great recipe that is easy to throw together on your busy soccer mom nights. This dish is packed with deliciousness and veggies. This is definitely a dish your kids will eat their broccoli. • Cook the macaroni according to the directions then add the broccoli in the last 2-4 minutes of cooking. Remove and drain. • In a large pan heat butter, flour, onion powder and milk. Add salt and pepper. Take off heat when thick and add 1 ½ cup of cheddar cheese. Stir. 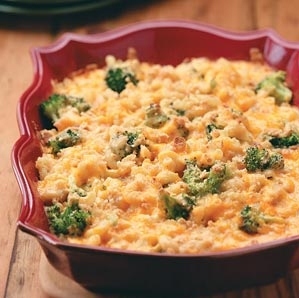 • Place macaroni and broccoli into a greased pan, then add the hot cheese mix. • Sprinkle the top with the parmesan cheese, the remaining cheddar cheese and bread crumps. • Bake for 25-30 minutes or until bubbly. We're celebrating Father's Day out of town, but you can bet I will be seeking out a Wendy's on my travels. I'm proud to help Wendy's spread the word about this special, fundraising weekend for Wendy's Wonderful Kids. This is the second year I have participated in the campaign, and you can, too. Though you may still be searching for that perfect gift for dad, Wendy’s has something that you can all do together to help other families! And it’s yummy, too! 1. Buy any Frosty product: On Saturday, June 16 and Sunday, June 17, for each Frosty product purchased, participating Wendy’s will donate 50-cents to Wendy’s Wonderful Kids. (includes the original, parfaits, shakes and floats). 2. Use a mobile-friendly website to check in at Wendy’s: Wendy’s will donate 50-cents for every customer that checks in at Wendy’s restaurants during Father's Day Weekend (June 16 and 17 only) using Wendy’s special mobile-friendly website found at www.wendys.com/treatitforward. 3. Re-tweet: Now through Father’s Day, re-tweet one of @Wendys special Twitter posts with the hashtag #TreatItFwd—and Wendy’s will make a 50-cent donation. You can follow @Wendys on Twitter at https://twitter.com/wendys. 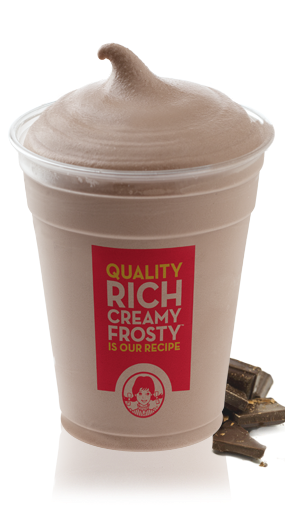 As a thank you for purchasing a Frosty over Father's Day weekend or for using Twitter to promote the fundraising hashtag, you can win lunch, or dinner courtesy of my blog, and Wendy's. I"m donating my gift card to the cause as well. One winner will be chosen at random, and will receive 2 gift cards with a total value of $17. A winner will selected on Tuesday, June 26, 2012. Please make sure you enter the giveaway via the rafflecopter. It will select the winner. Disclosure: I am participating in this campaign through The Motherhood. I was not compensated to write this post, and I am donating the gift cards that I received to my readers. I will be paying for my own Frosty's this weekend because I think this is a wonderful campaign. I packed my last school lunch yesterday. My son is on the traditional calendar, and school is now out for the summer. In full disclosure, I really didn’t pack as many school lunches as I originally planned. I really had good intentions at the beginning of the school year to pack my son’s lunch, but he is more of a “hot-food” kind of guy and wanted to eat in the school cafeteria. When he’s at school, he thinks he is eating in a restaurant, and this really should not be a surprise to me since this is the same child who would scream “restaurant” when he was 2 years old and I would take him home for lunch after preschool. Every day that he bought the school lunch, I would ask him what he ate. He would rave about his school lunch, and he would happily disclose all the fruits and vegetables he consumed at one sitting. 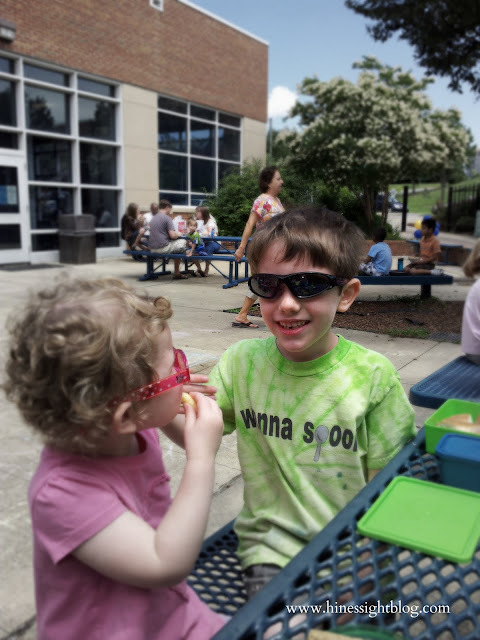 The school’s broccoli was one of his favorite sides, and he loved the peaches. Meanwhile, my packed lunches came home with a lot of waste. 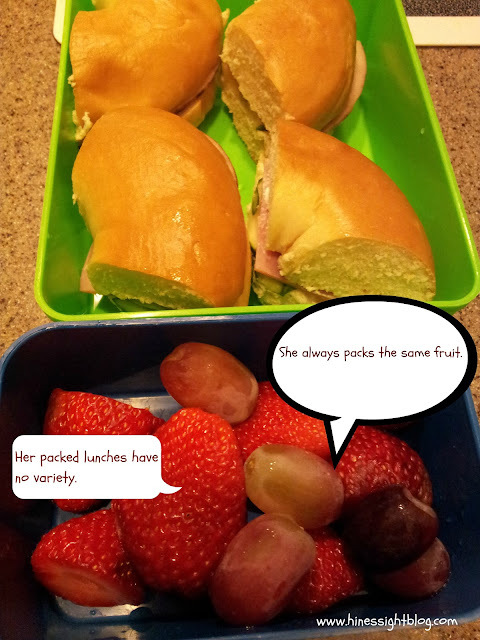 I will admit that I’m not really a domestic diva, so my lunches were pretty ordinary, but I still tried to pack a well-balanced healthy lunch. I volunteered weekly at his school. The cafeteria managers would come into the teacher’s lounge where I was working, and I would ask, “So, what are you cooking today?” When they responded with roasted chicken, roasted potatoes, broccoli, and farm-fresh peaches, I knew that I would choose that entrée over my own packed lunches, too. I still packed his lunches when hot dogs or cheese nachos were on the menu, but he ate in the cafeteria more often than I packed during the week, and I was OK with that. Here’s why. In North Carolina, the Blue Cross Blue Shield Foundation of North Carolina (BCBSNC) has recently invested $1.2 million to expand the North Carolina Department of Agriculture and Consumer Services’ Farm to School program to increase access to fresh, healthy food in cafeterias across the state. 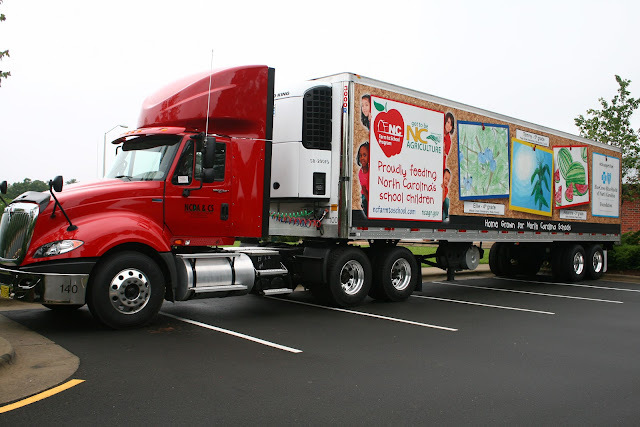 These trucks deliver fruits and vegetables to NC Schools. Since 1997, the North Carolina Farm to School program has been supplying cafeterias with locally grown produce. Last year, almost 1.4 million pounds of fresh fruits and vegetables were served in N.C. school cafeterias. Not all school systems are participating yet, but the majority of the school systems are on board. This new BCBSNC grant will provide funding for five new refrigerated tractor-trailers to increase the distribution of local fruits and vegetables to 35 additional school systems statewide. It will also increase the number of local farmers participating in the program from 75 to 105. This means for the next school year, even more N.C.-grown produce will make its way into our schools. In May, over $200,000 of North Carolina strawberries were purchased from local farmers to be served in school cafeterias during strawberry season. For year-round schools, seedless watermelons, cantaloupes, tomatoes, grape tomatoes, peaches, sprite melon, cucumbers, zucchini, sweet corn, and apple slices will be arriving the first of July. This chart gives you an idea of what’s available locally all year. I’m proud that my agriculture state is finding ways to help school-age children learn how to make healthy food choices and the importance of proper nutrition. 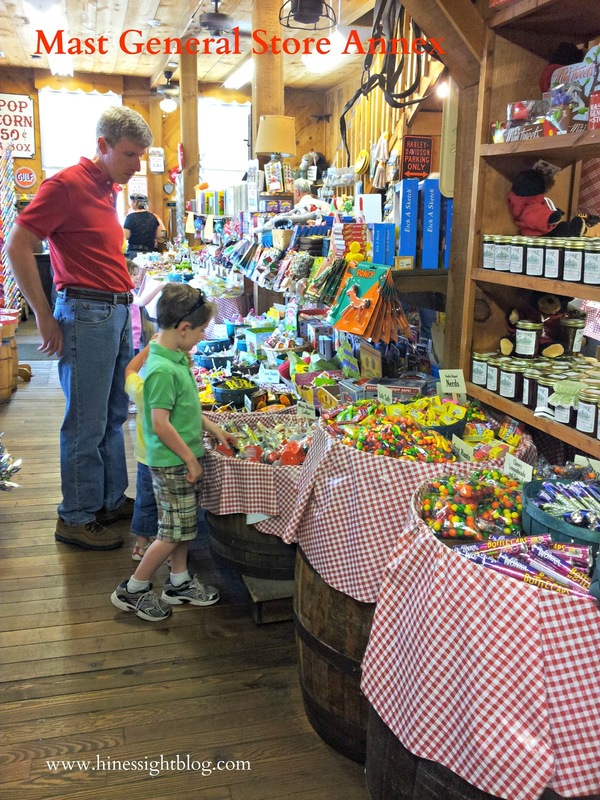 My son also visited a North Carolina farm this year for a field trip, and had an entire lesson plan on the farm-to-table approach with foods. With this initiative, I feel more comfortable sending my child to school without a packed lunch. I applaud the state and BCBSNC Foundation’s efforts of keeping our children healthy. Here’s the bad news for me. I learned that the school’s sautéed spinach is apparently better than my own. Perhaps I need a few cooking lessons! Have a great weekend! We're looking forward to our summer break. Could Iron Man Be Staying at The Umstead Hotel and Spa in Cary, NC? The Triangle is a little star struck because Iron Man III is in town filming this week. I don't know anything that you don't, but I thought it would be fun to take a look at one of the Triangle's top luxury hotels. Let's just say that many celebrities have gone through these doors. Could they be pampering some super-heroes this week? If so, I am sure that Gwyneth Paltrow and Robert Downey, Jr. will be pleased with their stay. 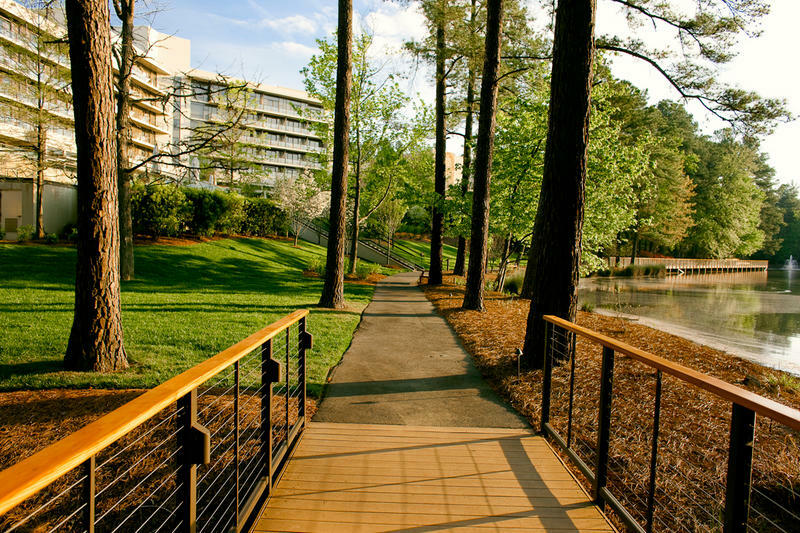 Let's take a look at the Umstead Hotel and Spa in Cary, North Carolina. Those of you who have been following my blog for a while now know that I like to talk about luxury hotels. Since having two kids, I have not walked through the doors of as many luxury hotels as I would like, but that just gives me more opportunity to make my “wish” list even longer for the time when the Hines get back on the road. I make lists for hotels all over the world, but sometimes the best gems may actually be in my own backyard, so to speak. 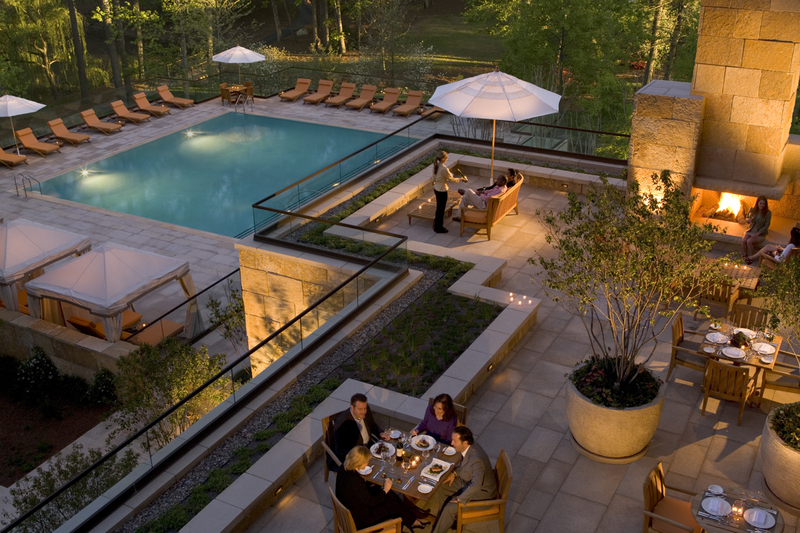 Case in point is The Umstead Hotel and Spa in Cary, North Carolina. 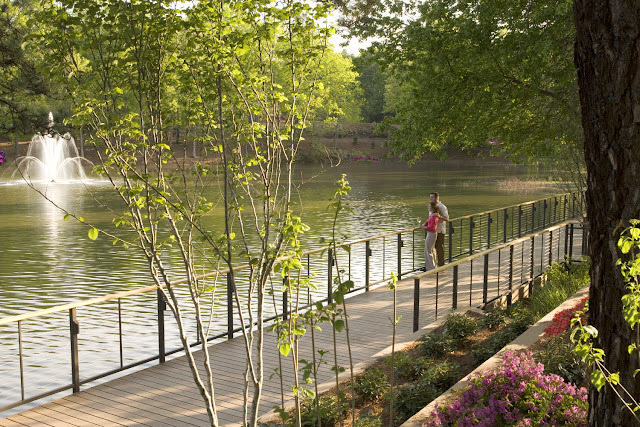 This artistic, and serene, AAA five-diamond property is nestled on twelve acres of lakeside grounds that give guests easy access to any location in the Raleigh-Durham area, yet as soon as you step onto the grounds, you immediately feel an oasis of tranquility and luxury comfort. 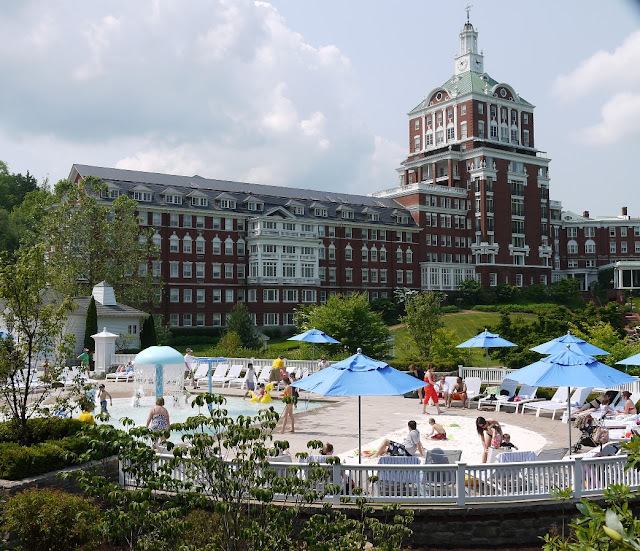 Since the property is fifteen minutes from my home, I’ve not experienced the hotel as an overnight guest, but several of my friends have checked in for an “overnight getaway” from their children recently, and their experiences have made me absolutely pea green with envy. They shared some of their glorious experiences over a glass of wine. “Leigh, we sat by the pool, had drinks and an early dinner on the terrace. We felt as if we had been transported a million miles away,” my girlfriend told me. That’s all I needed to hear. I admit that my original envy started as soon as she told me she and her husband were checking in to the hotel, but the stories of the comfy beds, delicious food, rest, and relaxation caused me to come home immediately and add The Umstead to my list under a new category of “sitters can keep the kids overnight” list. It’s no surprise that this local hotel is so grand, and welcoming. The Umstead is also a member of the prestigious Leading Hotels of the World, a hospitality organization representing 450 of world’s finest hotels, resorts, and spas. This Cary gem has received The AAA Five Diamond award since its opening in 2007, and its signature restaurant, Herons, recently received the The AAA Five Diamond honor for 2012, which is one of North America’s most respected symbols of culinary excellence and the highest honor bestowed by AAA for a restaurant establishment. For those of us who don’t necessarily talk in culinary speak, I’ll translate into what we do know. It’s melt-in-your-mouth fancy cuisine, worthy of holidays and special occasions. If your wallet can swing it, a regular old night of the week would be nice, too. Nothing I serve at home looks this beautiful. Even my burgers don’t look this good. I know. You’re thinking: Burger? You’re talking about a five-diamond restaurant, and you’re showing me a burger? It’s not just a burger. 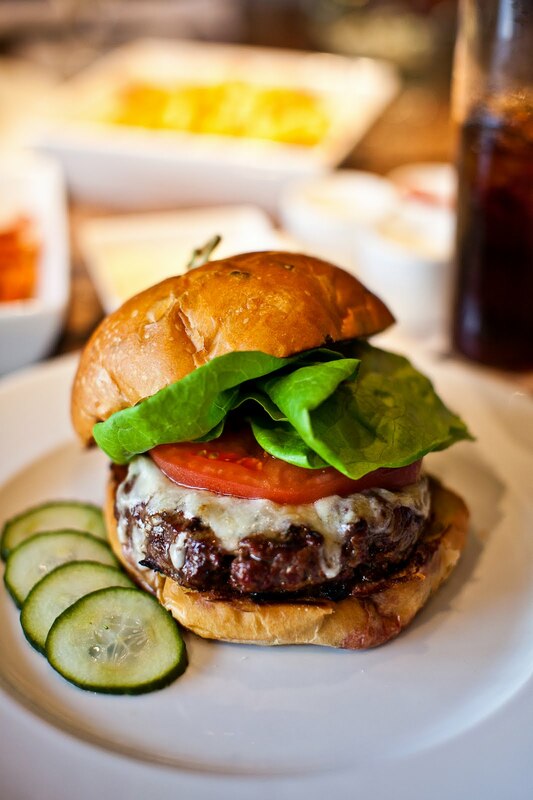 It’s a ground Kobe beef burger with heirloom tomatoes and house-made pickles. 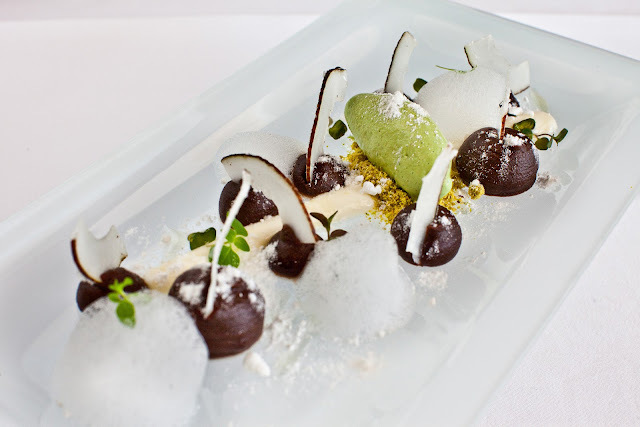 What I’m trying to say is that some of my best dining experiences on my vacations have been casually, in different parts of the hotel, where you experience the same five-star quality and service that you would receive in the signature restaurant. This is true for The Umstead, too. 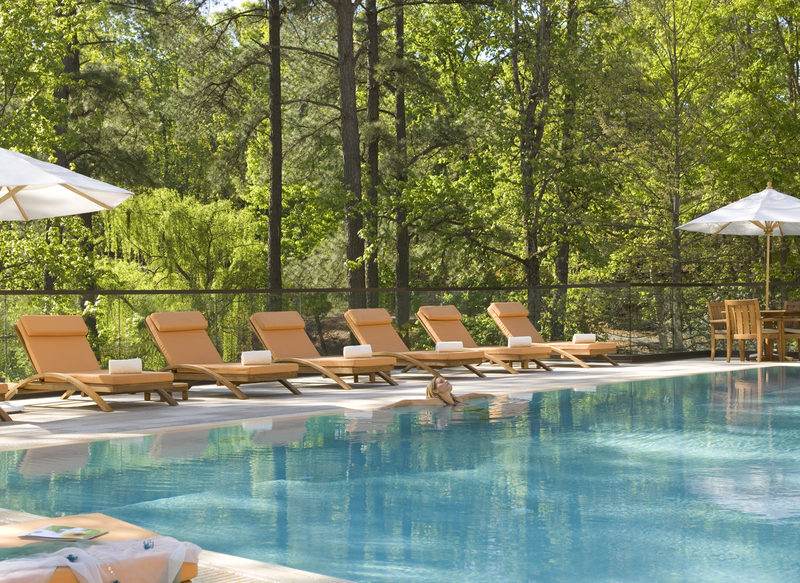 Guests at The Umstead can enjoy spectacular, locally sourced seasonal delights by the pool, at a cozy table in The Umstead Bar, while lounging in the spa, or in the comfort of their guest room. If you are out shopping locally and want to have a more casual meal, then the lounge is ready to serve. Weekend brunch at Herons really delights and can add some sparkle to your Saturday or Sunday, if you are living in the area. All menus at this luxury hotel are planned and prepared by Executive Chef Scott Crawford and Chef de Cuisine Steven D. Greene. Do you have one of your own gems in your own town? 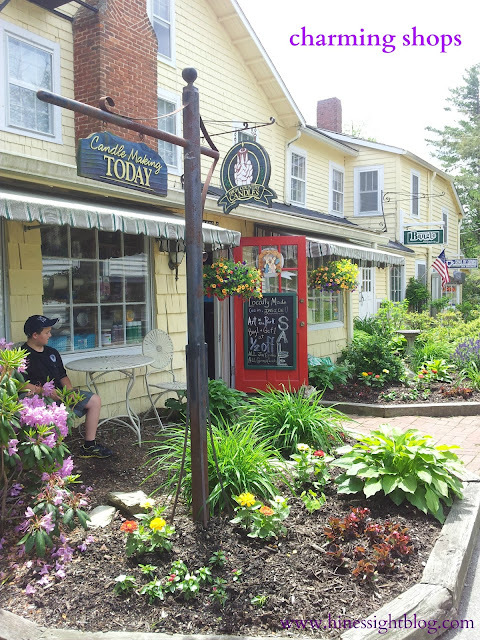 Nestled in the Blue Ridge Mountains of North Carolina, a quick exit off the Blue Ridge Parkway, is one of my state’s most charming and quaint towns. At least that is my opinion. Aside from the snow in the winter, I think I could live here. A lot of people feel as I do. The town’s population swells from 1,500 to 8,000 in the summer months. When we visited in May, the town was bustling with activity. There’s a lot for city folks to love about this affluent mountain town without the pretense. Dogs can walk with their owners, and children can play in an awesome park right in the middle of the town square. My children loved this park right in the middle of town. Eating homemade ice cream is a must-do on Main Street. It’s fun to people watch and enjoy the atmosphere. 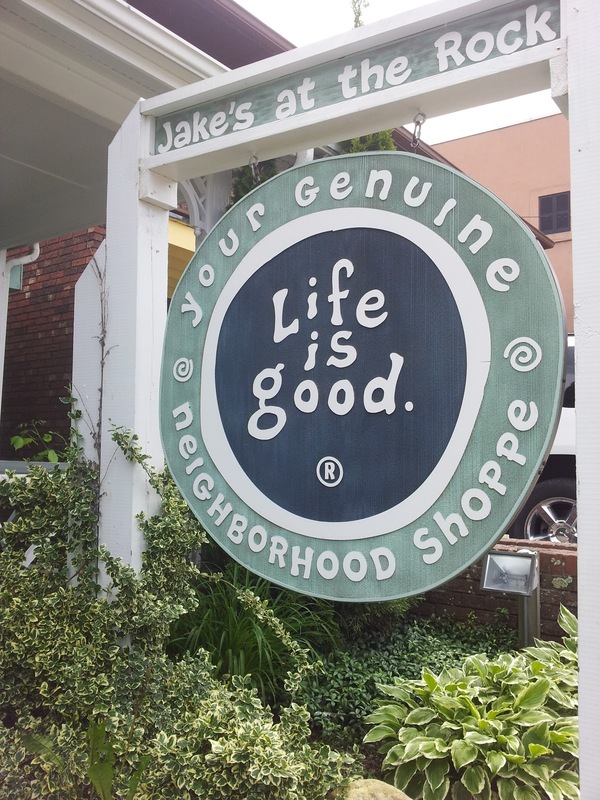 The upscale boutique shopping is grand, and so is the outlet shopping. It is shop after shop.Your credit card will certainly get a workout if you are a shopper. But carrying those unique shopping bags is when life gets good. Right? 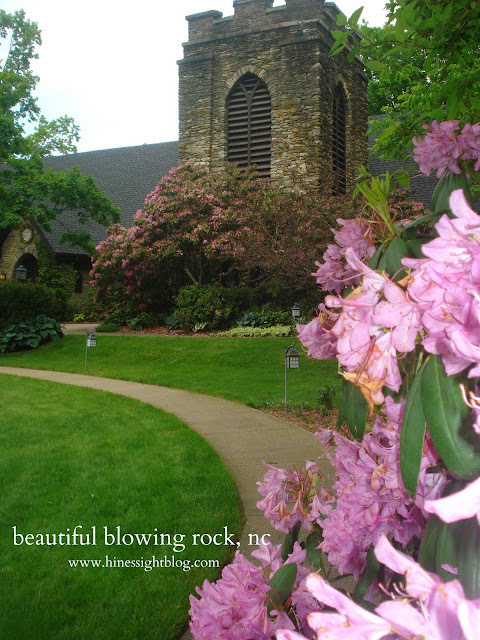 Blowing Rock is also a haven for art galleries and artists. From May to October, the town hosts six shows called “Art in the Park.” One hundred exhibitors showcase works of art from paintings to jewelry to pottery for one Saturday each month. 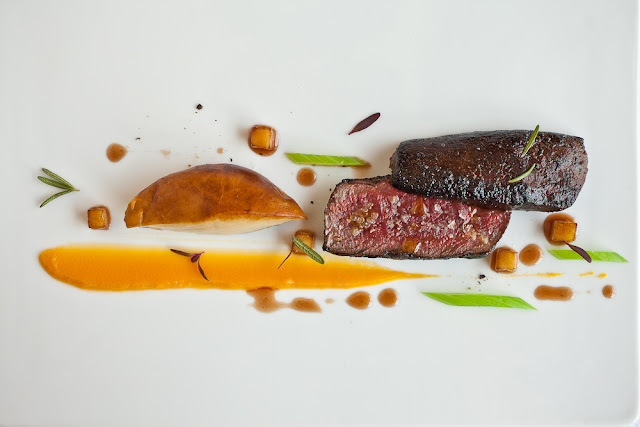 For foodies, Blowing Rock is an epicurean adventure. It has some of the best restaurants in North Carolina, from five-star delights like Crippen’s Country Inn to down-home favorites like Woodlands BBQ. On this trip, I met up with blogger Mandi McClure’s family and had dinner at the locally owned Woodlands. And just a quick note: If you are a fried-okra fan, order it. It’s delicious. 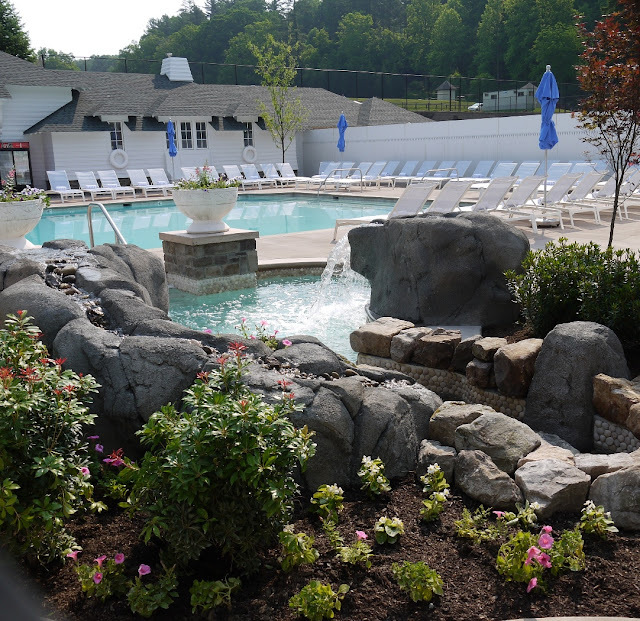 Blowing Rock is also home to the Relais and Chateaux Inn, TheWestGlow Resort and Spa, which was named by Travel and Leisure Magazine as the “Number 2 Destination Spa in the World.” That’s quite an honor. With kids in tow, I didn’t get a chance to visit the Inn this time, but you can bet it’s on my list for another time. And, of course, kids who come to Blowing Rock, North Carolina, love to visit Tweetsie Railroad, a scenic Wild West theme park featuring a three-mile, steam-powered train ride through the North Carolina mountains. My kids loved Tweetsie, and I’ll share that fun adventure on another day. But I want to show you one more photo to showcase this town’s beauty. The churches are gorgeous. This is the Episcopal church in town. Can’t you just imagine a wedding here? 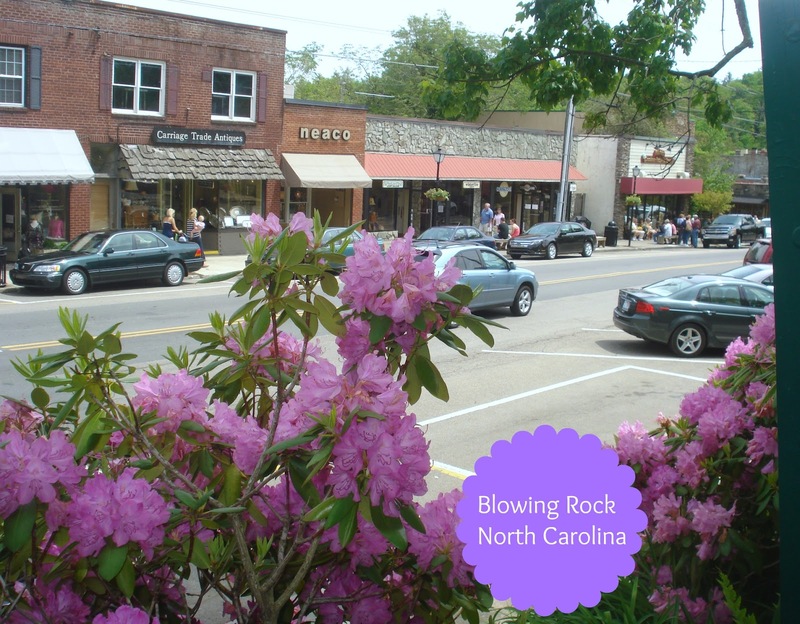 Visit http://www.blowingrock.com/ to learn more about this town. 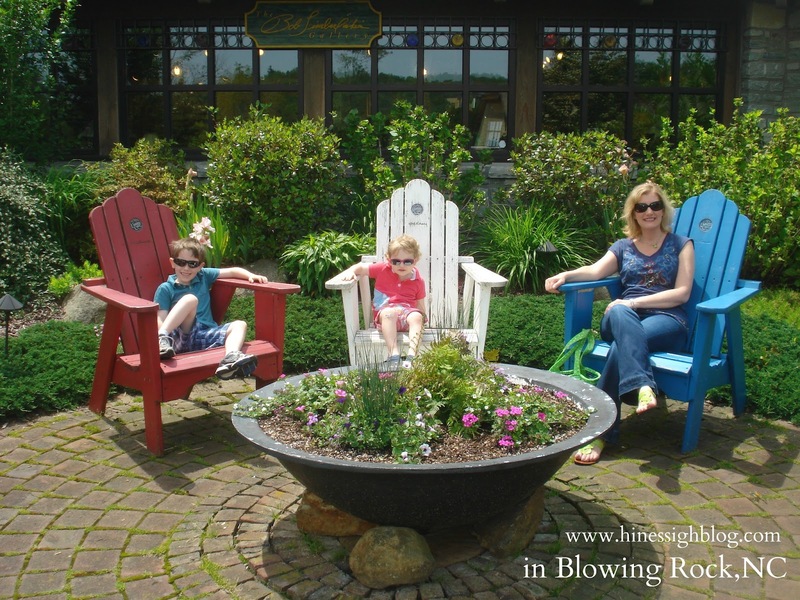 While exploring Watauga County, my family was a guest of The Mast Farm Inn in Valle Crucis, North Carolina, which is an easy, 30-minute drive to Blowing Rock. You can learn more about this exceptional and luxurious Inn in my “Pack Your Bags” post for this month. 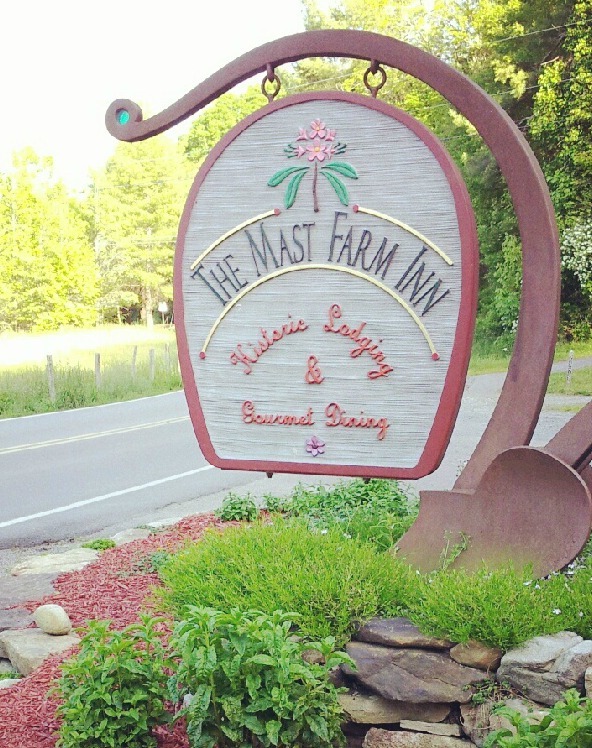 The Mast Farm Inn, being quite popular on weekends, was booked on one of the nights we were in town. 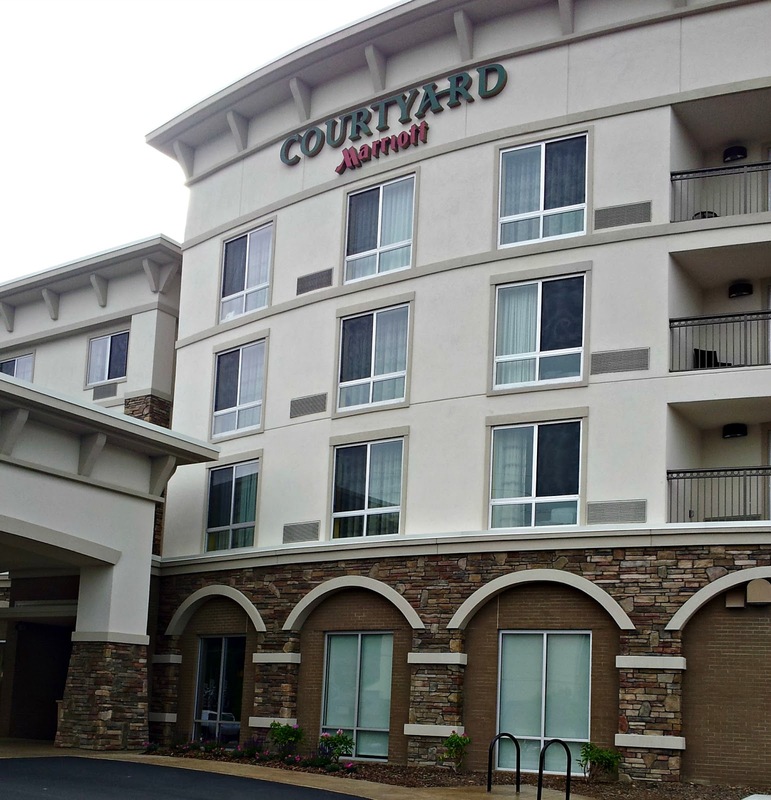 After reading many reviews, I felt the brand new Courtyard Marriott in Boone, North Carolina, about three miles from Tweetsie Railroad, was an excellent family choice. Built this January, it gives guests a modern luxury, boutique-type stay. 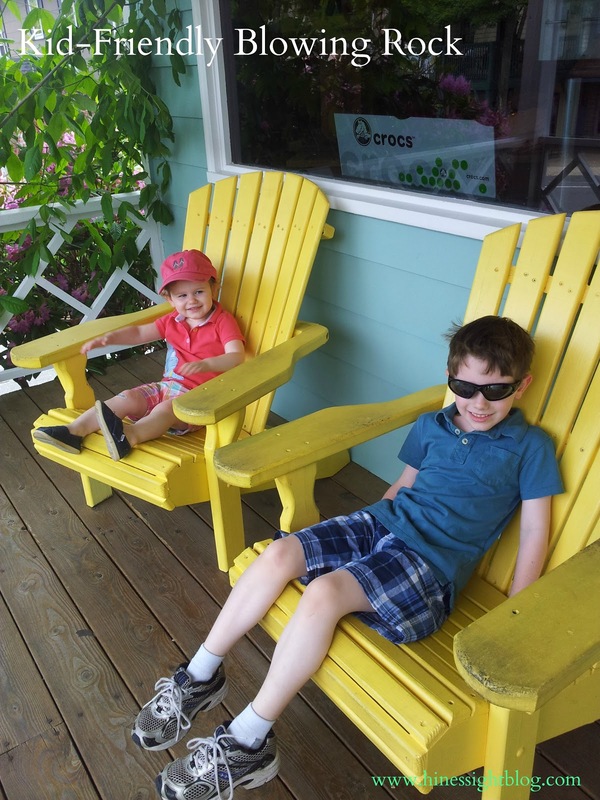 My kids loved the pool, and I think the outdoor fire pit area of the hotel is a great amenity. 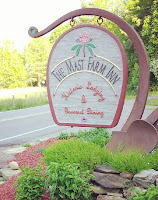 My thanks to The Mast Farm Inn, located in Valle Crucis, for being the main sponsor for my trip to Watauga County. 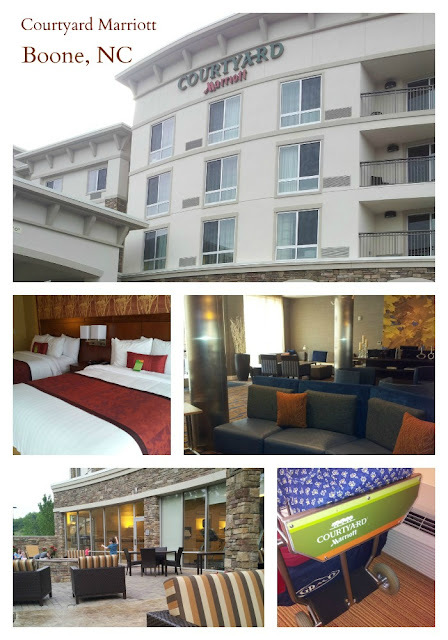 The Courtyard Marriott Boone also helped sponsor my trip and gave my family a discount on our lodging. Affiliate links.